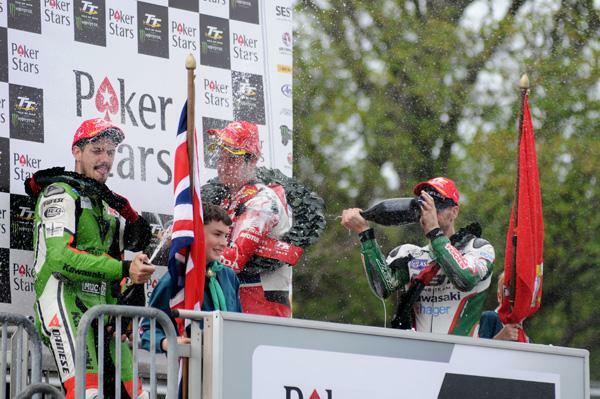 John McGuinness took his 23rd TT victory shattered Bruce Anstey's outright lap record from last year's Superbike race with a sensational speed of 132.701mph as he came home 14.2s clear of James Hillier in the PokerStars Senior race with Ian Hutchinson in third. The victory came after the original race was red flagged on the second lap and a shortened four lap race was restarted at 2.45pm. The Honda Racing rider took the lead from Hillier at the Bungalow on the opening lap and when Hutchinson made a mistake at Signpost Corner just before the solitary pit stop, he was able to pull away for his seventh Senior race victory. At Glen Helen first time around, Hillier was again in the lead but it was close with McGuinness only eight tenths behind and Hutchinson just a tenth adrift of the Honda rider. Anstey was holding onto fourth ahead of Johnson and Dunlop but Martin had a really poor start and was way down in 13th place. By Ramsey, Hillier still led but his advantage was down to six tenths of a second and it was now McGuinness in second with Hutchinson down to third, four tenths further back. Anstey was in fourth with two seconds covering the leading four with Dunlop now in fifth and Hickman sixth. An opening lap of 131.850mph - the fastest ever from a standing start - gave McGuinness a 1.2s lead over Hutchinson with Hillier back to third, a further 1.8s back. Anstey, Dunlop and Hickman filled out the top six, the latter having posted his first ever 130mph+ lap, with Martin getting going in seventh. McGuinness added half a second to his lead as they swept through Glen Helen for the second time with the top five remaining the same although Martin had moved up to sixth ahead of Hickman. The lead was back up to 1.9s at Ramsey although Martin was now up to fourth, tucking in behind Hutchinson on the road. A stunning, new outright lap record of 132.701mph gave McGuinness the lead and the gap had shot up to 10.9s as Hutchinson overshot at Signpost. Hillier remained in third but he was only 0.6s ahead of Martin as the Tyco BMW rider also broke the old outright lap record with a lap of 132.398mph. Anstey was now in fifth and Dunlop sixth and in an astonishing lap, the first 11 riders all lapped at more than 130mph. The order remained the same at Glen Helen on lap three and McGuinness had added almost a second and a half to his lead. Hutchinson, in turn, was over five seconds clear of Hillier who had also edged away from Martin also to the tune of five seconds but Dunlop was slipping back and was now in eighth. The Morecambe Missile added another second on the run to Ramsey and as he started his final lap around the Mountain Course, his advantage over Hutchinson was an impressive 17.5s. Hillier was a further 6.6s in arrears and he was coming under serious pressure from Martin once more with the difference between the duo now just 2.5s. McGuinness was in full control of the race and all eyes were on the battle for second now as Hillier took over the second podium position at Ballaugh, extending his gap to Hutchinson to four seconds as they rounded Ramsey Hairpin for the final time. It was all about McGuinness though and the Honda man duly came home for his 23rd TT victory, equalling the seven Senior TT wins of Mike Hailwood. Hillier completed his excellent week in second, also lapping inside the old lap record at 132.414mph, with Hutchinson holding onto third from Martin. Dunlop - whose final lap was 132.515mph - and Cummins took fifth and sixth as Anstey faded to eighth and so it was Hickman who took seventh. David Johnson finished ninth and Michael Rutter tenth. Hutchinson had the consolation of winning the overall Joey Dunlop TT Championship and with Dan Cooper finishing in 17th place, he secured the TT Privateer's Championship. James Hamilton was the rider involved in the incident and he was taken by airmed to Nobles Hospital where his condition was described as serious but not considered life threatening.